A simple Google search of "statistical odds of eating the same food as two other friends in different states" doesn't come up with much. 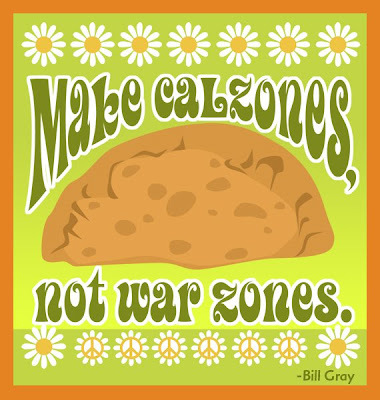 But it certainly doesn't detract from the pleasure I felt when I learned that Econ, Jack and I each ate calzones for dinner tonight. It would make my day if Oatess, unbeknown to us, picked up a "Twilight Zone" from D.P. Dough in Athens. Nope, he had mac and cheese. That's right. I know what he eats for dinner.It's usually the first thing I ask about whenever we talk on the phone. Doesn't Oatess eat mac and cheese every day? I would figure it wouldn't be too far-fetched even to guess what he was eating for dinner on a given day (mac and cheese, rice, ramen). Oatess is a man of exquisite taste and unflinching consistency.